Its the Pokemon Center in NY's 3rd Birthday. 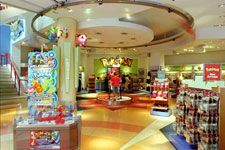 The Pokemon Center in NY first opened up on November 16, 2001. Since the first day it opened everybody goes to the Pokemon Center for The Video Games, The Trading Card, the ultra pokedex and more Pokemon merchandise. To celebrate their 3rd Annivsary they are having a big Birthday Party This Saturday November 13. It will be from 11:00 A.M. - 3:00 P.M. Also there will be a Pokemon Trivia Challenge it will be at 12:00 P.M. and 2:00 P.M.
Also you can get your picture taken with the most famous Pokemon of all Pikachu you can get your picture taken from 11:00 A.M. - 12:00 P.M. so bring your camera! So come down to the Pokemon Center in NY on Saturday, November 13 for the Birthday party of the Pokemon center in NY.